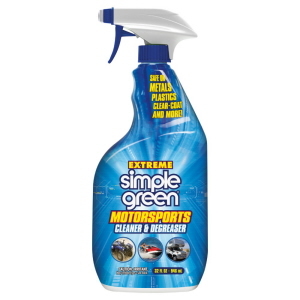 Do you need a good Automotive cleaner and degreaser for your car, truck or motorbike. 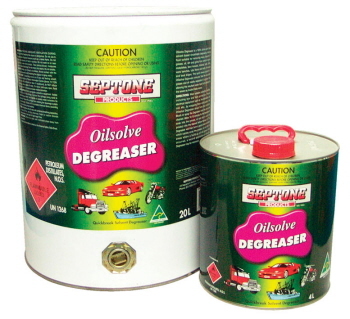 Check out our range of industrial strength degreasers for your vehicle. You can pick it up in store, have it conveniently delivered to you. 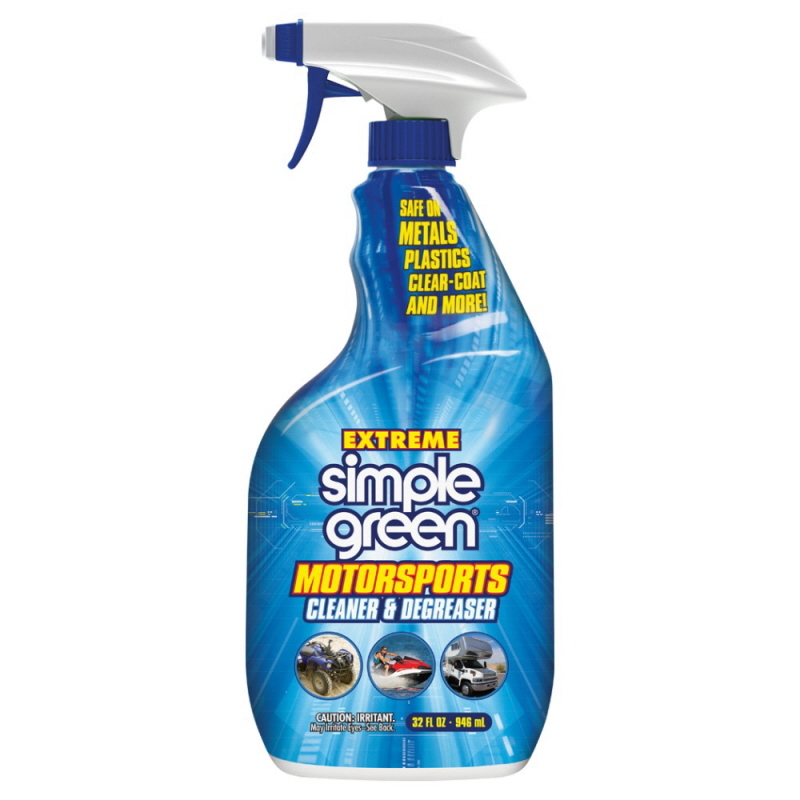 Extreme Simple Green Motorsports Cleaner & Degreaser is a non-corrosive, non-toxic, ready-to-use, non-flammable, effective heavy duty cleaner and degreaser for use on interior and exterior surfaces, automotive and marine-grade carpet, precision parts degreasing and the list goes on. 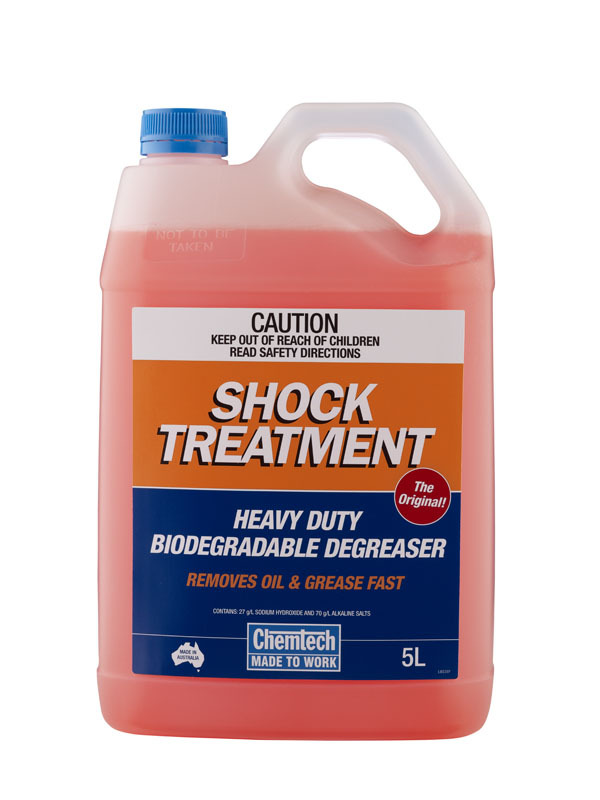 This cleaning and degreasing product is extremely aggressive on grease and heavy soils, but won't harm the high-performance surfaces found on motorsports equipment. 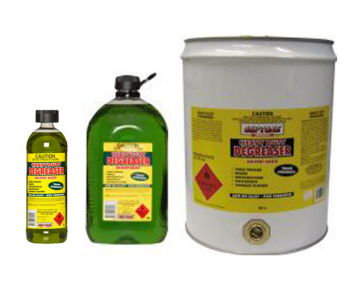 The safer clean for motorcycles, ATVs, sports cars, RVs, watercraft, bicycles, aftermarket parts, equipment and more. Heavy Duty Degreaser Quick Breack Detergent Cleaner. It has a quick break formulation which is specifically designed for the quick removal of grease, oils and dirt from all types of heavy machinery, vehicles, concrete floors and equipment. It has a pleasant citrus perfume. 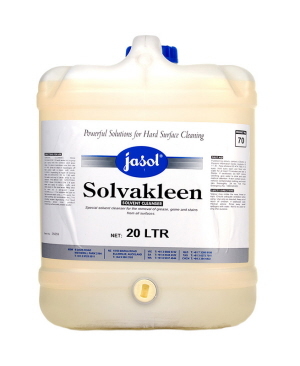 It cleans plastic, painted surfaces, stainless steel, glass, chrome, vinyl, or porcelain. Available in 5 and 20L. Activ D.O.T Heavy duty concentrated general purpose degreaser designed for the removal of oils and soils from floors, machinery, heavy transport and locomotives. 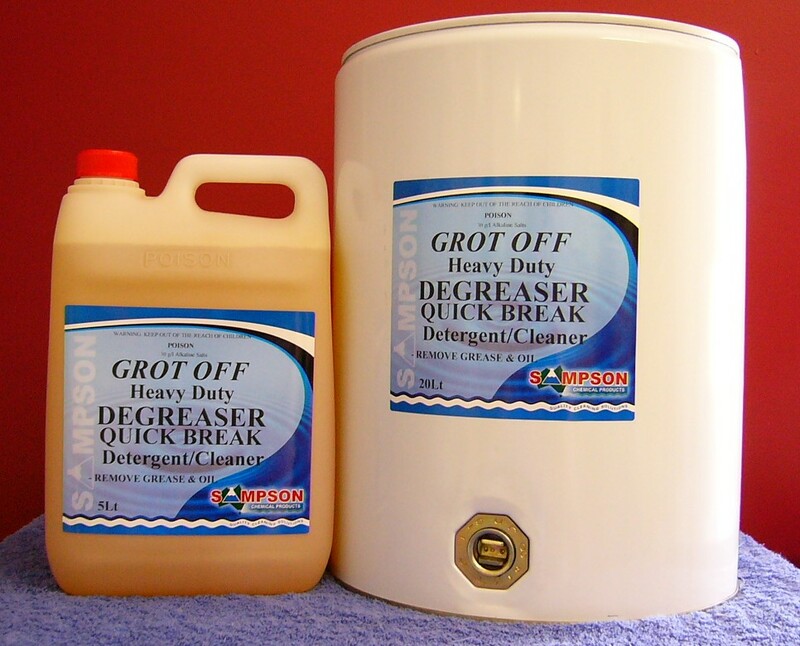 It is a water based positive emulsion product manufactured from biodegradable surfactants incorporating a patented blend of detergents formulated to provide an efficient alternative to solvent based cleaners. 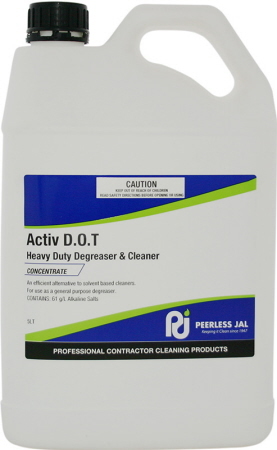 Can be used with all forms of cleaning equipment. Available in 5L, 25L and 205L. 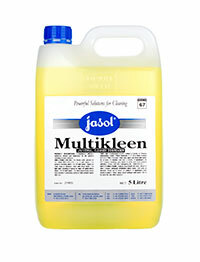 Jasol Multikleen is a multipurpose Cleaner for Normal Grease and Oil. 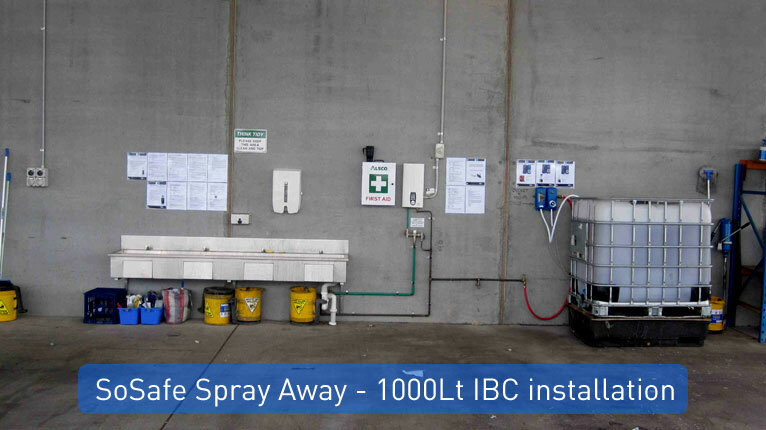 Non-caustic, spray on/wipe off application, safe to use on most surfaces, effective in hard water. 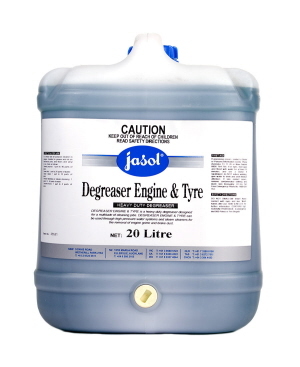 Economical engine and tyre degreaser. AQIS Approval. NZFSA Approved. Available in 5L, 10L, and 20L. 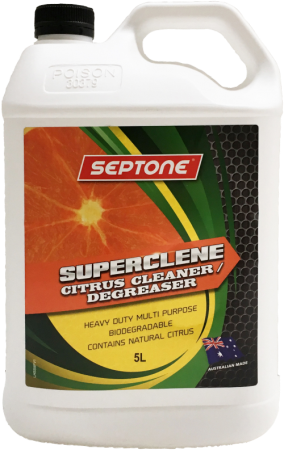 SoSafe Spray Away pH Boosted with Surface Active Technology is Australia’s fastest growing industrial degreaser with independently proven quick break capabilities*. 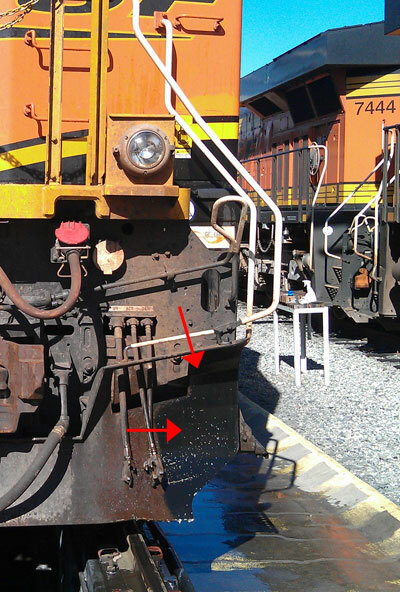 NOTE: Use SoSafe Rapid Off for tar and bitumen removal. Swarfega® Powerwash Multi-Purpose Vehicle Traffic Film Remover with wax effect finish, to remove all types of general road grime for commercial vehicles and plant equipment. For medium to heavy soilings. It is ready to use, economical, biodegredable, non-rinse formula high performance vehicle cleaning power wash.
Chemtech CT14 Engine and Bilge Degreaser is concentrated, water soluble, biodegradable, hydrocarbon-free, non-toxic, non-flammable, thus it safe to use. 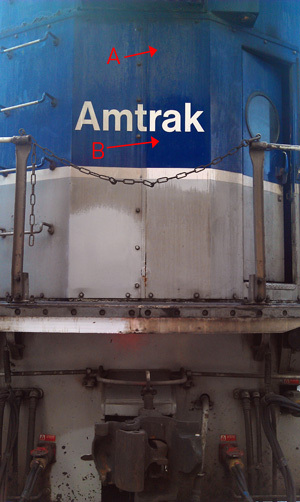 It can also be used through pressure washers & steam cleaners. 1L makes up to 20L. 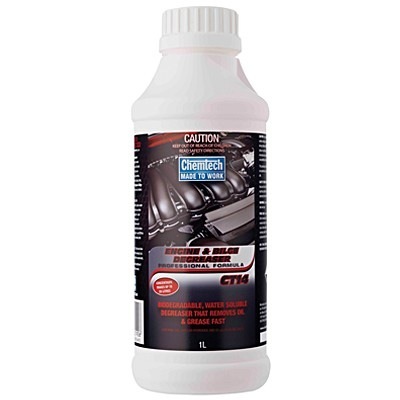 One of the great interior care products. 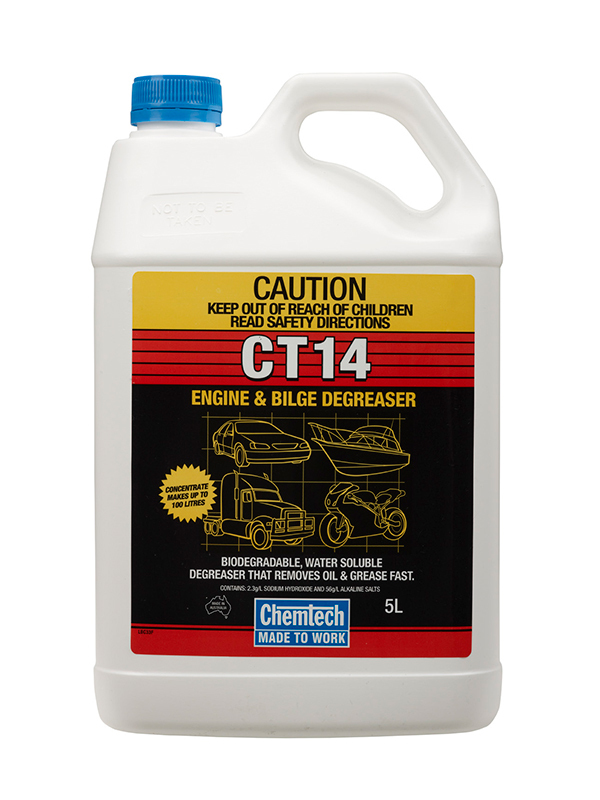 Great for engines, driveways, lube bays & transmissions. 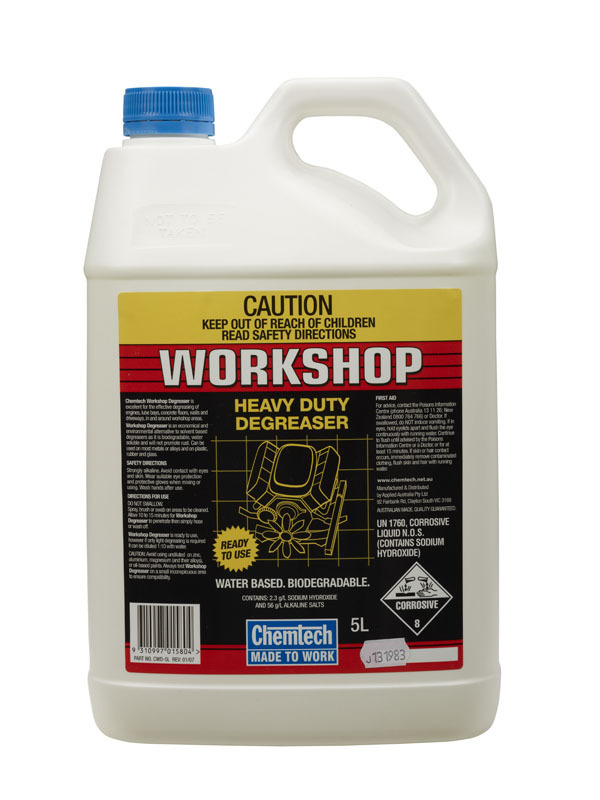 This degreaser thus offers best value for money as, aside from its superior degreasing with excellent results, it also contains inhibitors that assist in protecting certain vulnerable surfaces (e.g. aluminum) whilst being cleaned. 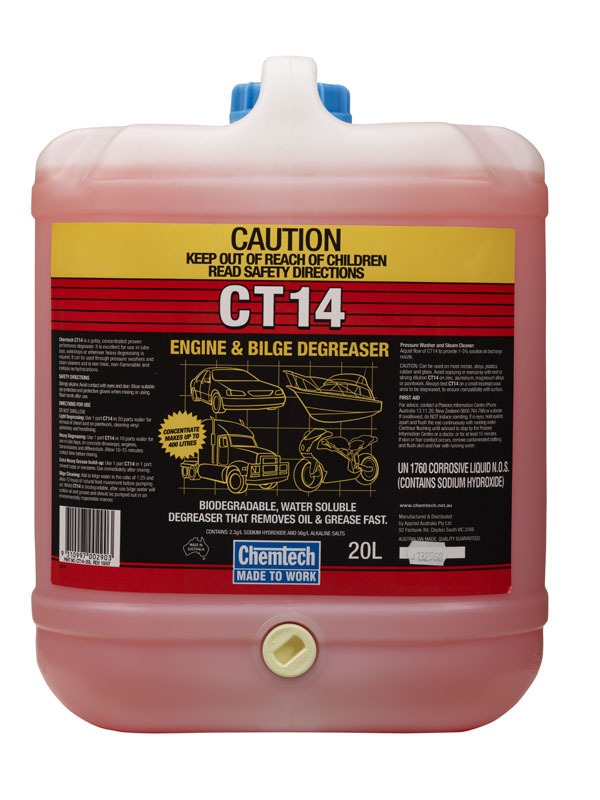 Chemtech CT14 Engine & Bilge Degreaser is available in 1L, 5L, 20L and 200L. 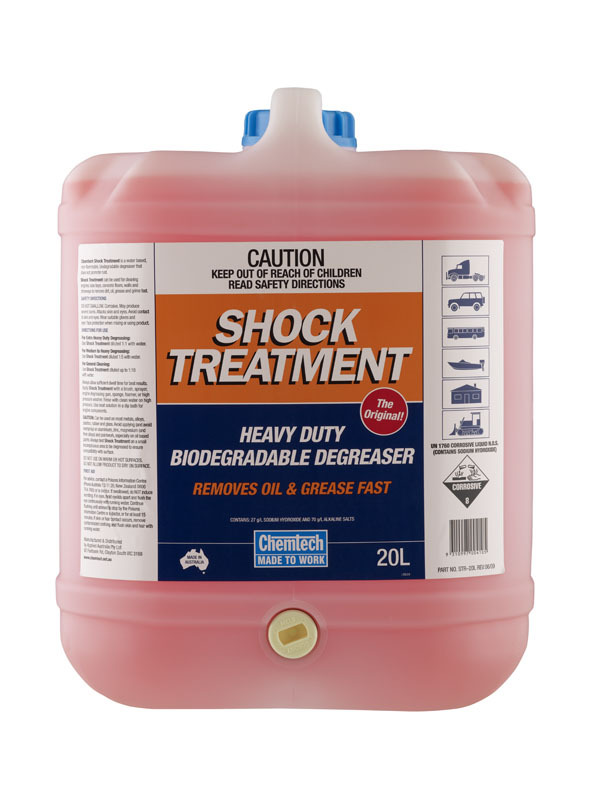 Chemtech Shock Treatment is specifically formulated heavy duty biodegradable degreaser. This water based, non-flammable degreaser is ideal for all types of engines, equipment parts and driveways. 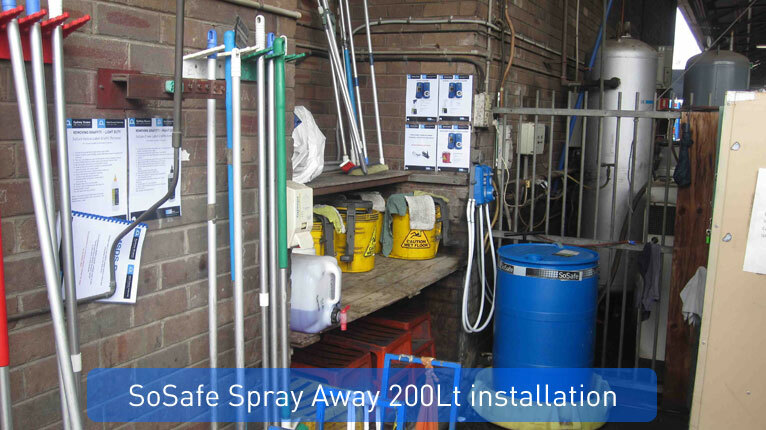 It is safe to use on plastic, rubber, glass and most metals and alloys. Available in 5L, 20L, and 200L. 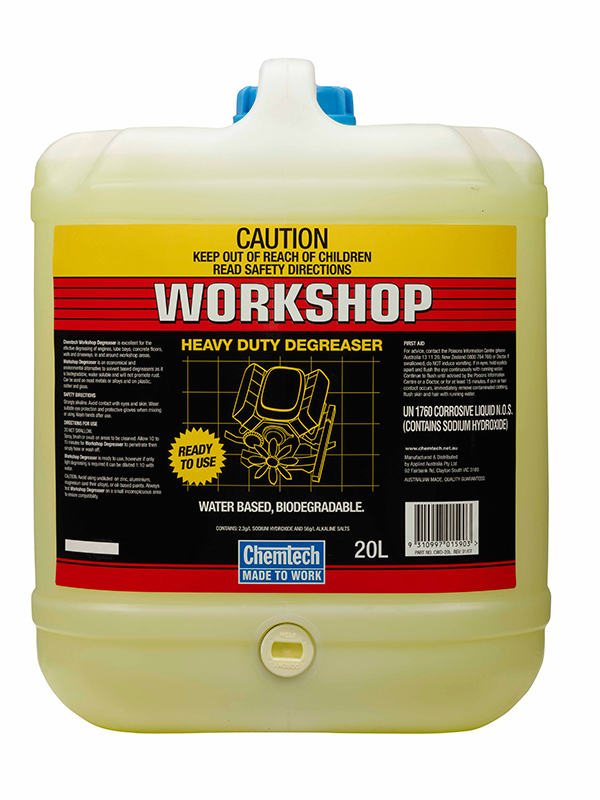 Chemtech Workshop is ready to use, water based, biodegradable, heavy duty degreaser that converts oil and grease into a water soluble solution. It is excellent in the workshop or home for engines, lube bays, walls, and concrete floors. Available in 5L, 20L, and 200L. Truck and heavy vehicles road film remover. Available in 15L, 200L and 1000L. 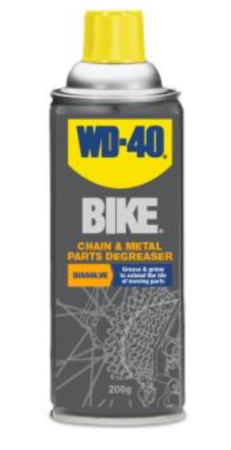 WD-40 BIKE Chain and Metal Parts Degreaser safely dissolves and removes grease from frames and drivetrains. 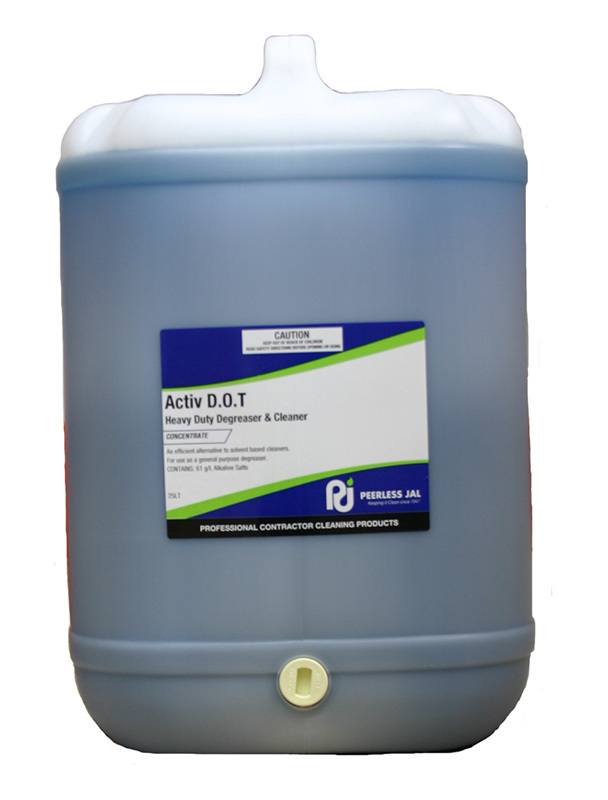 Thick, biodegradable formula clings to surfaces for effective cleaning. Safe for carbon fiber, titanium, aluminum, steel, chrome, rubber or plastic. 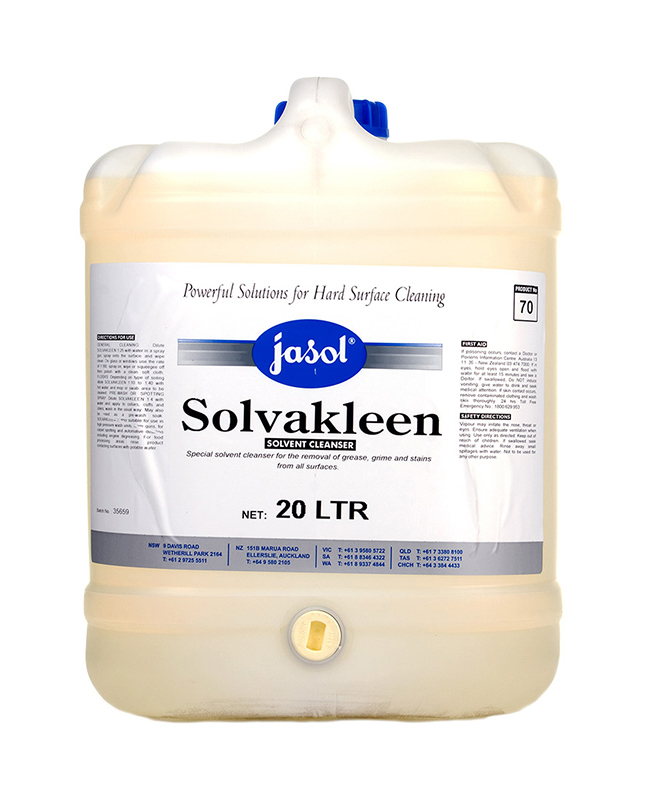 Jasol Solvakleen Multipurpose Solvent Cleaner and Degreaser is a clear, colourless, non-caustic, non explosive liquid cleaner ideal for the removal of grease, grime and stains from inert surfaces. 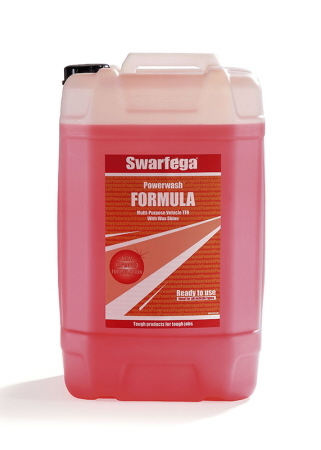 It can safely be used on metal surfaces, woodwork, tiles, fabrics, rubber, plastics and painted surfaces. It is non flammable and readily miscible with water. AQIS Approval. Available in 5L, 20L, and 200L. 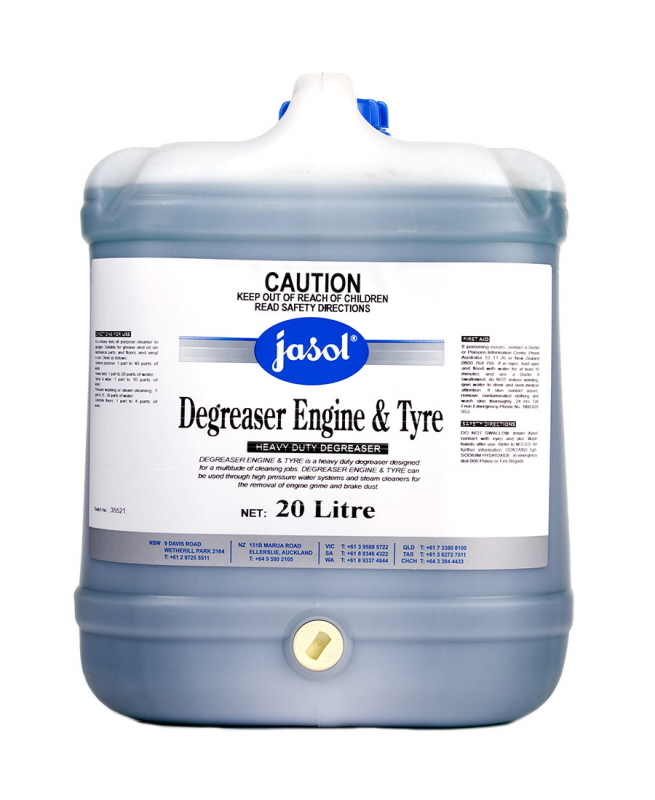 Jasol Heavy Duty Engine and Tyre Degreaser, is a water based, solvent-boosted detergent, highly active, non-flammable, economical designed for a multitude of cleaning jobs. 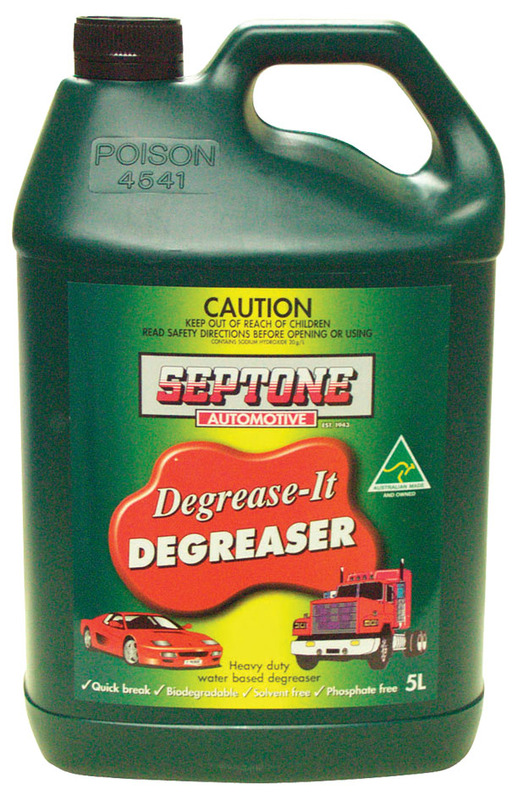 It can be used through high pressure water system and steam cleaners for the removeal of engine grime and brake dust. 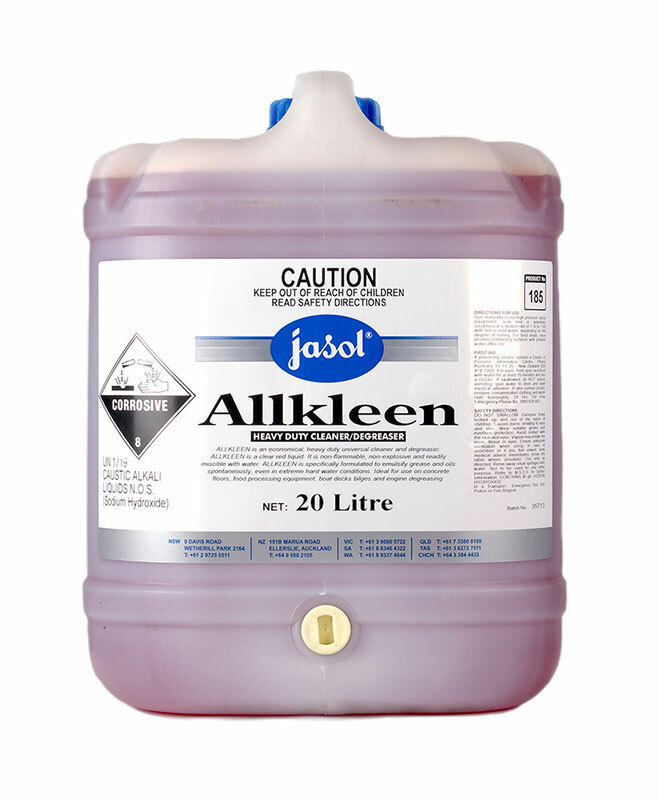 Jasol Allkleen Heavy Duty Cleaner and Degreaser is a clear liquid, non-flammable, non-explosive specifically formulated to emulsify grease and oils spontaneously, even in extreme hard water conditions. Not suitable for aluminium. It is ideal for use on concrete floors, food processing equipment, boat deecks, bilges, and engine degreasing. AQIS Approval. KOSHER Approval. HALAL Approval. NZFSA Approved. Available in 5L, 20L and 200L. Jasol Redic 55 Heavy Duty Alkaline Degreaser effective on a broad spectrum of soils and is safe on most metals including aluminium, copper, steel and stainless steel. 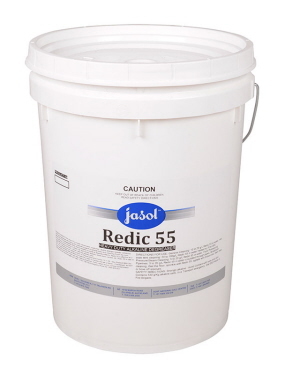 Jasol Redic 55 is a caustic free, alkaline detergent powder containing 100% active ingredients with wetting and sequestering agents to provide heavy duty cleaning of even the most difficult soils. Available in 20kg and 200kg. It passes hydrogen embrittlement tests for high strength steel and sandwich and immersion corrosion tests on aluminium. 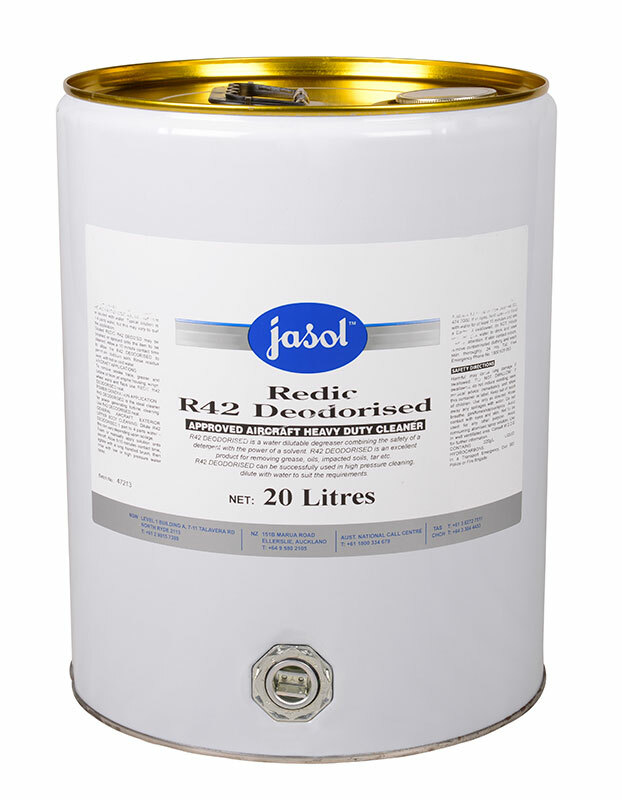 Available in 20L and 200L. See label for instructions. 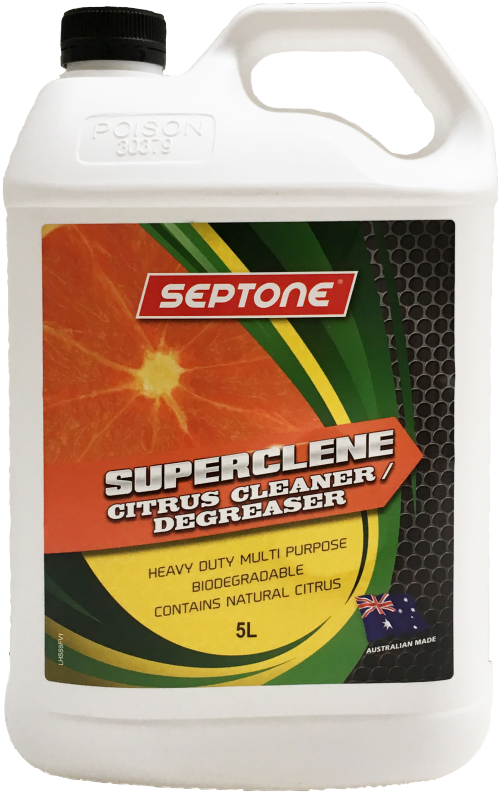 3-IN-ONE Professional All Purpose Cleaner & Degreaser, deeply penetrates to quickly remove grease, oil, dirt and grime, while leaving a clean citrus smell. The professional strength formula with its foaming action cleans fast, making equipment run smoother, last longer and look like new. 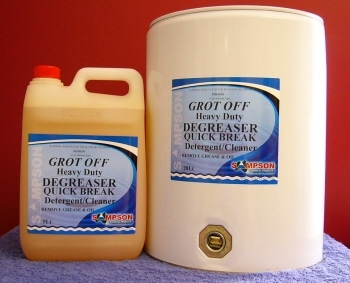 It quickly removes grease, oil, dirt & grime. Citrus Foaming Action for Extra Cleaning Power. Suitable for all Metals, Plastics & Rubber*. Prolonged exposure to rubber not recommended.